After several years away from the limelight, Nadia Forde is officially back. There was a time when you couldn't open a newspaper without seeing the Irish model's face in it - either for her photocall work or for news about her personal life - but after a stint on I'm A Celebrity in 2014 and subsequent moves to the UK, Australia and Japan, she adjusted her gaze on her personal life and being a new mother. But, now she's back with a new career and she's dressed the part. 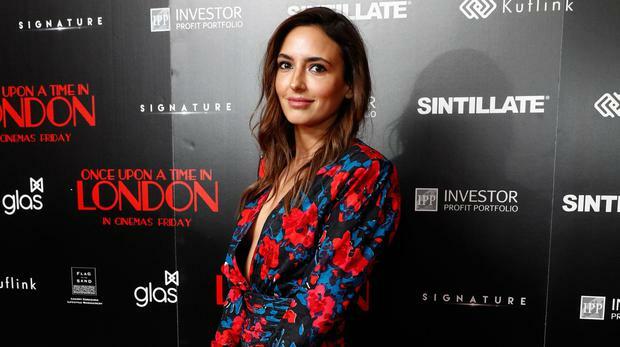 Nadia hit the red carpet last night for the premiere of Once Upon a Time in London, a gangster movie in which she makes her film debut in a step towards the acting success she has been privately working towards during her career hiatus. Forde was joined by the rest of the cast at London's Troxy, a historic music venue, for the premiere on Monday night, in a floral patterned plunging mini-dress with her fiancé Dominic Day, sporting fresh facial injuries from his rugby career. Her decision to return to work was a conscious one as she hopes to set an example of following your dreams for her six-month-old daughter Wyatt. "I've been toying with when am I going to go back to work," she told the Irish Independent's Weekend magazine earlier this month. "For the first few months I was not interested in doing anything outside of our family and now that a little time has passed, I want her to see me be me and my own person, and not just mummy. I want her to see me have my own passions and my own thing - that's important to me because she gets to see that with Dad. "I think the mum bubble is amazing and it's the best, but I also want her to grow up seeing me being more than just Mum and having that other aspect to my life. It's a balance - and balance doesn't come straight away."